In a reversal of roles, one former scholar recounts her experience leading current scholars. Feb. 2-Feb.4, 93 prospective Regent students flooded Founder’s Inn to compete in Regent’s annual scholarship competition a record for the university. This competition, called Scholars’ Weekend, is a three-day event in which the incoming freshman get a taste of Regent, while engaging faculty and creating bonds that will last a lifetime. In the past, the competition was limited to 25 scholars, but Regent’s excitement over this year’s applicants led to the event’s massive increase in size. Inviting nearly quadruple the usual number was a daunting task, but it gave more students the opportunity to be a part of the Regent community. As a first time Leader myself, I was thrilled with the opportunity to create special connections with the future class of 2021. To them; former scholars, such as myself, are not just their tour guides, but their first fans. Another opportunity arose for current students to get involved through the hosting of visiting scholars. By welcoming students into their rooms, hosts give these incoming freshmen a taste of Regent’s community – and our excellent residence halls. “It was really fun getting to open up our room and to share our own experiences with them so far. As a freshman myself, I was able to relate to them better since I was in their position last year,” said Christina Tucker, a former scholar. 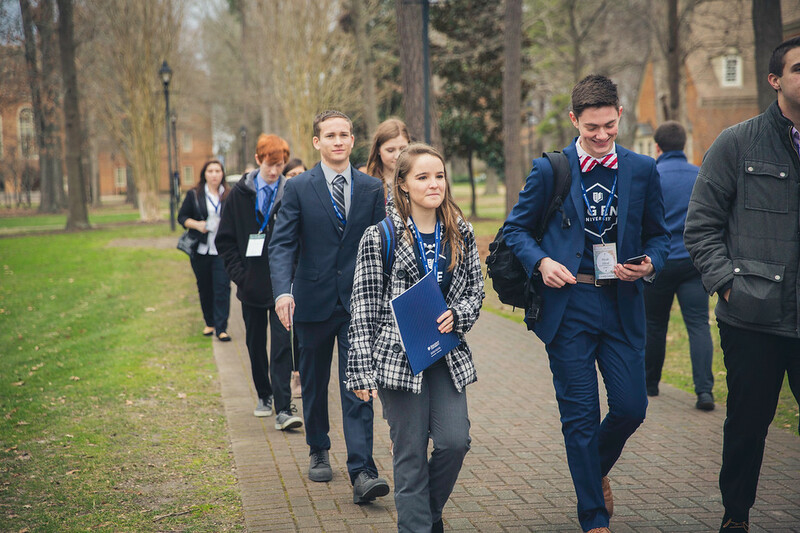 The overnight experience is unique to Scholar’s Weekend, and a tradition Regent wishes to continue. While Scholar’s Weekend is an exciting time for current Regent students, it can be nerve-wracking for the scholars. Despite this, most come out the other side of the competition with happy memories and new friends. Scholar Marie Pustynovich enthused about her amazing experience, and stated “I feel reassured that it is a welcoming and safe environment with so many different opportunities I can go with.” Surprisingly enough, it wasn’t the photo scavenger hunt or the banquet that the scholars favored; the two best experiences reported were group bonding times and the interviews. “[The interviews] let me know that the faculty here cares to know what kind of person you are, not just who you are on paper. It actually makes me feel more welcome that they care who I am and not what number I am,” expressed Pustynovich. Though considerably larger than Scholar’s Weekends of the past, this year’s competition was a success. Making memories and sharing our love for Regent with these scholars was a priceless opportunity. The planning team took everything in stride and put on a spectacular event. I can’t wait to see how these Christian leaders impact our campus in the fall!